Another Father’s Day has been and gone. For some, it was a case of grabbing a card and bag of sweets for their dad. Others go all out and have a big family gathering. Then there are those who have difficult emotions. Perhaps their dad wasn’t much of a dad, the relationship strained or absent. Then, of course, there are the bereaved. The children (young and grown) missing a dad. The dads missing a child or baby. So many different thoughts of ‘dad’, so many emotions, and now at just 38, I find myself experiencing all of them! 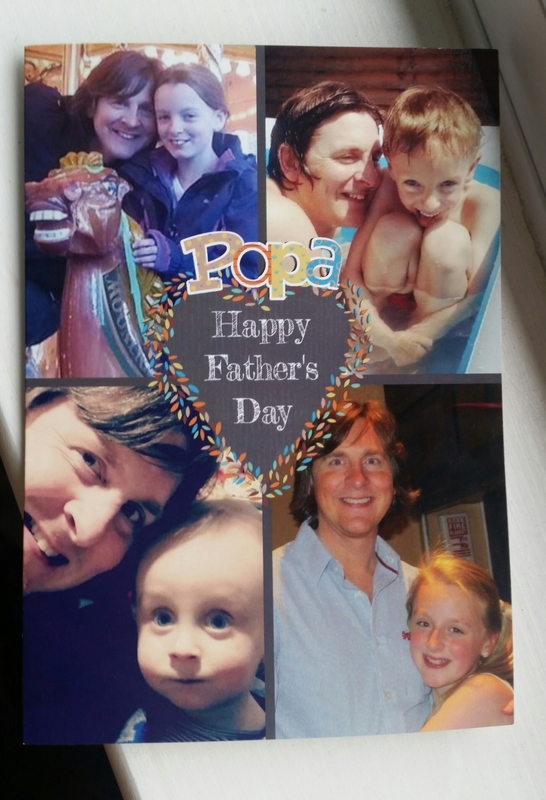 On Father’s Day, I organised a card and gift for my hubby from our children. Yet one of those children is already in heaven. I battled through the pain of buying a card to ensure he still had a memorable day and the children didn’t miss out on this opportunity to thank him for all he does for them. I know too well that his heart broke as much as mine as he read his card. The signature of his dead daughter scrawled alongside the other three names by his 7-year-old son. Nothing to add but her name. Days like this have naturally not been the same since she died. But this post isn’t about that. I wrote last year about Father’s Day. It doesn’t get easier. This post is about my experience of growing up without a dad. My mum already had my sister when she met my dad. Mum was 19 or 20, my sister about 2 or 3. All too young and playing at being in love, they decided to have a baby. Mum married him when she was pregnant with me, in 1976. She was a beautiful blooming bride. One of the few photos I have of my dad is this one. His mischievous face says it all really. I loved her silk polka dot dress and I also used to love that I was with them on that day, too. But that’s where my ‘memories’ of having my dad in my life end. It wasn’t to last long. After coping with the heatwave of ’76 not long after their wedding, I arrived in early September. Three months later, my dad walked out and never came back. It was a long time before I was aware that I didn’t have a dad. Mum doing it all seemed normal to me. I asked her about him occasionally but she didn’t know much more about him after he left. He literally disappeared, ignoring that we ever existed. She never spoke badly of him, though she was honest about some of the mean things he did to her during their relationship. He liked to drink and was rough and cruel. As they hadn’t been together all that long, there wasn’t much more to talk about. The only way I knew he existed was from the child maintenance slips that cluttered the kitchen worktop along with numerous bills. These impersonal statements reminding me constantly that someone out there fathered me and was having to pay for his ‘mistake’. The statement showed a measly amount, something like £6 a month, for my upbringing. It was a sum automatically taken from his salary by the government. There was no identifying information on them, although I was curious and would check them from time to time to see if there were any clues as to where he was. But every time I looked at the slips I’d feel worthless. Surely he would give us more, if he knew me? If he knew that some days we barely ate or had to go to bed really early, freezing cold to our bones, because there was no heating or electricity? And why? Why didn’t he want to know me?! My friends had dads but I couldn’t relate. My mum told me my dad was unfaithful, a lot. So I believed that’s what men did. With any dad I met, I wondered when he would leave his wife. I was highly suspicious of anyone claiming to be happily married. I knew I took after my dad, my family would tell me so. That was hard to accept at times. I knew nobody liked him. He had behaved like a monster. I felt guilty for looking like him. I wondered if I reminded my mum of the bad memories. I’m tall and my dad was too. Around 6ft 5” or thereabouts. I recall a man I used to see every morning on the way to school. He was tall and slim, with short grey hair. I imagined he looked a bit like what my dad might look like (from the few old Polaroid photos I had to go by). Every time I saw him I became more convinced that he was my dad. My dad was walking past me every day and not realising I was his daughter! I would glance at him. Sometimes he’d look back at me. The poor guy must have thought me a very creepy child! My curiosity turned to longing. As I hit puberty I found not having a dad hard to accept. I wasn’t sure what I was missing exactly, I’d never had it after all. I didn’t want him – the monster – I just wanted a nice dad who wanted me. Self-pity crept in, as I wanted to be like my friends. While other kids were coveting items like the latest Nike trainers, all I wanted was a dad who gave a damn. It was the not feeling wanted that hurt the most. My mum (and her family) was all I and my siblings had. She did an amazing job with very little, and I felt so guilty for dreaming about my dad. I would imagine that he’d become a decent man with a good job who would come and take us all out of the poverty trap we were caught up in. To give my mum the life she deserved. We grew up surviving. There were lots of hardships, but what I remember most now, as an adult, is sitting on the worktop reading James Herriot or Jane Austen novels to my mum by the light of the gas ring in the kitchen. She introduced me to the escapism that books offered. We kept each other company. She didn’t care that I couldn’t read the dialect properly or understood the jokes. We would sit in the near-dark and laugh at the story together or she would explain it to me. She played games with us. Me and my sisters would spend weekends putting on shows for her – making funny tape recordings or dressing up in sheets and curtains. She taught me to knit and sew. She played music all the time – everything from opera and classical to Led Zeppelin and the Rolling Stones. It was her meditation. She gave us freedom and love in equal measure. She was well-read and intelligent, and taught me the importance of using your mind, no matter what your circumstances. As a single parent she had to take on part-time jobs to make ends meet – anything from cleaning to management. She taught us a strong work ethic and how you should be able to do any job if it means supporting yourself. I credit her with giving me the confidence and tools to live independently and build a career doing something I love. As a child, I was in awe of her and fiercely protective. I knew she was having to endure so much for our sakes and I suppose I wanted to make it up to her in some way. Some days I would get up before her and clean the house downstairs so when she came down she’d have a surprise. I wrote her notes and pictures. I was aware she must have felt awkward on Father’s Day and sometimes I gave her a card. She was, and still is, father and mother to us. I’ve been married for 16 years. It hasn’t always been easy but marriage isn’t. Having a long marriage was something I never thought possible when I was younger. I’ve really had to work through some natural trust issues to get where I am today. One of the things that attracted me to my hubby was his stable, calm nature and I could tell that he would be a good dad. He was fun, attentive and committed. Even if we split up (don’t forget I went into this fully expecting it to end at some point) he would be there for our children. He wouldn’t abandon them like my dad did. Yes, it’s unromantic, but life isn’t Jane Austen. I saw how hard my mum had it and wanted to avoid repeating history. I was right, because he’s a wonderful dad and husband. He loves each of his children with everything and has always been committed to our family unit, putting us first every time. So on Father’s Day, I firstly wanted to honour my mum – who really was the best of both. And my hubby, who is an amazing father and taught me how to trust again. This entry was posted in Life with grief, My musings about life and tagged family, father's day, mothers, single parent by Chasing Dragonflies. Bookmark the permalink. I can only imagine how hard it must have been for you as a child, not to have your dad around. My dad has been dead for almost twenty years now but when I read posts like this, I’m thankful for the time I had with him. My heart goes out to you, lovely. We can’t change the past and we are not responsible for the actions of our parents but I think that we can make sure that we learn something from their mistakes. Thank you, that is such a lovely comment. I felt quite emotional reading it. I suppose having my old children, with my husband being actively involved, makes it that bit harder at times to know that I missed out on that bond growing up. In saying that, I’m not bitter towards him at all. Most likely he thought he was doing the best thing by keeping out of my life, and I expect that’s true. While my dad didn’t disappear, he wasn’t around much at all and I had a lot of similar feelings to you regarding men and marriage. I never expected to marry or have my own child and I had a lot of trust issues in the beginning of my relationship with my now husband. Even now, I still say “If we split…” which people find bizarre.